Building Relationships in Sales Training Materials will help train your sales team and supervisors how to consistently build strong rapport and strategic friendships in business. Train customer-focused selling, understanding effort vs. results, how to win friends and influence people, and many more amazing topics to increase productivity. Seeing is Believing This sample manual to teach Building Relationships for Success in Sales is in MS Word format. Want to see the topics you will cover in this course? 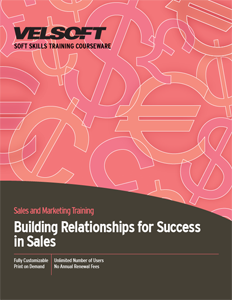 Check out the Building Relationships for Success in Sales Course Outline.